During the war, Counihan had visited the state Coal Mine at Wonthaggi Victoria, and made a number of drawings of the miners in his sketchbooks. Some of these were developed into paintings from 1945, and he used his memories of the trip and his sketchbooks, while making these linocuts in 1947. The series of six prints was exhibited at an exhibition of the Studio of Realist Art (established March 1945) at David Jones' Art Gallery, Sydney in August 1947, from which the Gallery bought its set. Counihan priced the set at five guineas - the inexpensive price was intended to make them accessible to a wider audience. It was printed by James E. Flett on his flatbed press, on heavy M G lithographic paper. One additional impression was printed by the artist in 1971 on Japanese paper for the Newcastle City Art Gallery. The block is extant. 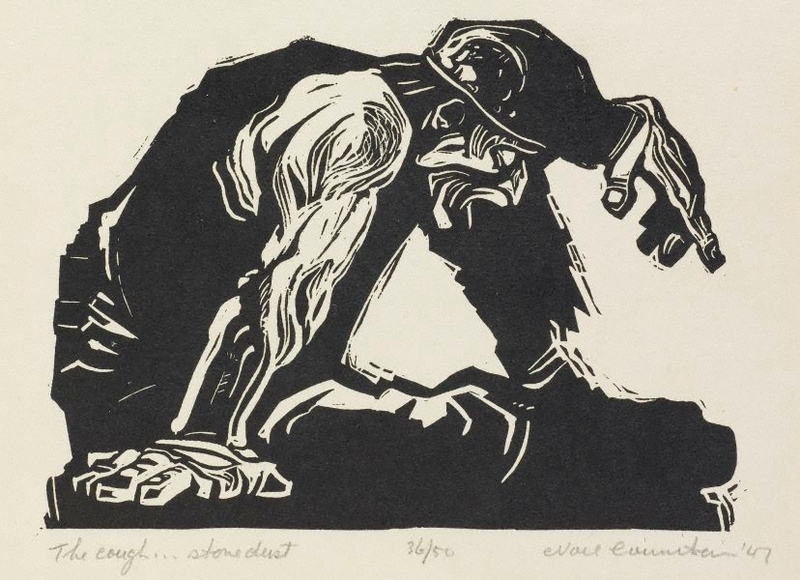 The print depicts a miner suffering from silicosis, an occupational lung disease developed by many miners, known colloquially as being 'dusted'. Signed and dated l.r., pencil "Noel Counihan '47". Peter Ward, The Weekend Australian magazine , 'Noel Counihan: A painter of class', pg. 24-28, Sydney, 16 Oct 1993-17 Oct 1993, 26 (colour illus.). Through artists' eyes: Australian suburbs and their cities 1919-1945 , 'The city observed to the city experienced', pg. 71-100, Melbourne, 2004, 78, 79 (colour illus.). This is the NGV's impression of this print.